I’ve driven past this dilapidated drive-in several times before, but always on the way north, so, I never stopped to take photos. Sure I pass it on the way back, but it is much easier to miss, and once you pass it, it’s gone. Finally, a viewer/reader and contributor sent me a link to some photos. It’s a pretty place, with lots of space... which is a commodity, of course, these days. I love the design of the ticket booth – a slender a-frame that looks typical for 1950, except that it was built in 1947 (and presumably designed a year earlier?). While I can bet the sordid stories floating around the internet (see the Cinema Treasures link above) about the demise of the place, I am sure a divided highway didn’t help. Then again, the Rustic sits on a divided highway (the same highway, in fact, miles down the road on the same side), and it’s still open. Who knows, if the town had been a better steward and let the managers stay open, it could be enjoying a retro-heyday similar to the Rustic. A single-screen drive in movie theatre built in the mid-forties and open by 1947. The theatre operated well into the sixties, but eventually turned to showing adult-themed movies (much like another drive-in I know). 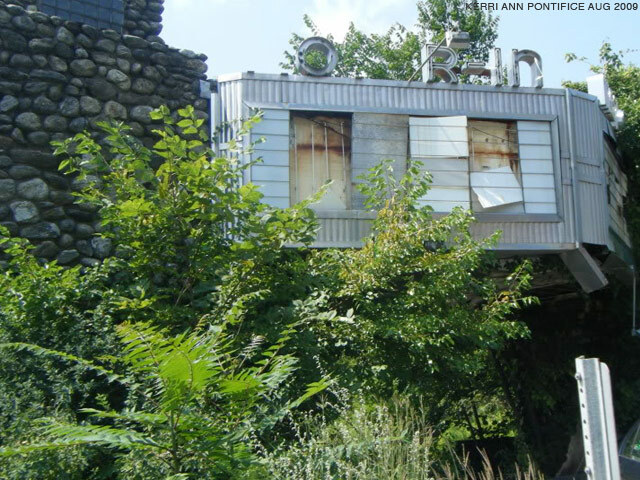 The drive-in closed eventually in the nineties due to poor relations between the management and the town officials. The price for the land was jacked up in the mid-ougth’s due to some speculation during the economic boom. Zack Jan 24 2016 I’ve been here (very recently) twice. First time, the old projection booth wasn’t boarded up (my father, being the juvenile funnyman he is, used it as a bathroom), and the old condiment/utensil counter was near the screen. The lot had fewer trees, and it was easy to get to the exit road. The 2nd time, in a side room, standing in the doorway, I noticed unwrapped straws and a pizza-themed paper plate. I heard that, in the mid-90s, a trio of businessmen tried to reopen the place. Well, we know how THAT turned out. If you wanna get in, no one’ll stop you. Park outside the main gate, walk over the chain, and walk right in. No sweat. John Gilbert May 2 2013 I grew up in a drive-in and wrote a story called "Reflections After Sunset. Memories of the Drive-in" Sadly, the site it was on is no longer on line. It was a great place to grow up. The few drive-ins that are left have been killed by digital. At $150,000 a projector, they are too expensive plus, you can't fill that big a screen from that distance. The picture is just too dim. Opened in 1947, closed by 1996 and for sale by 1999. Located along RI/MA Route 146, on the southern-bound side of the highway.